Formed in 2006, Oberon Tarana Heritage Railway Inc is a group of railway enthusiasts dedicated to bringing Oberon’s rail history back to life by restoring the Oberon-Tarana branch line and running trains similar to those in service on the railway in days gone by. In the early 1880s, the Oberon Railway League lobbied the State Government for a branch line to be constructed to run from Tarana to Oberon and on to Burraga to service the copper mines there. Finally, in October 1923, the line was opened. It only went as far as Oberon, as by the time construction was completed, the copper mines at Burraga had ceased operations. 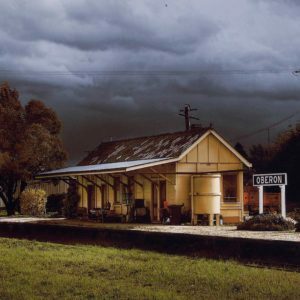 The railway quickly became the lifeblood of the town, transporting not only people but everything that came to Oberon, including cement for the dam wall and superphosphate for the farmers. It also carried to Sydney Oberon’s prime produce – peas and potatoes, wool and cattle. The one way trip took about an hour and a half, stopping at Carlwood and Hazelgrove on the way up to Oberon from Tarana. The branch line was suspended in 1979 when road transport meant the line was superfluous.